Need To Complete Your 7 Hours Of Driving and 7 Hours Of Observation? Did you purchase an online program that didn't include teen's 14 hours of in car driving and observation? Have you started a driving course with a different school and was unable to schedule drive time lessons? We have Great NEWS! You can transfer to Houston Area Driving Schools which is nationally accredited and approved with Driving Schools Association Of The Americas, Texas Professional Drivers Education Association and Texas Driver Traffic Safety Education Association. Houston Area Driving Schools highly professional driving instructors offers in-car training for every teen's driving needs. Transfer DE-964 Certificate (With Back Portion Completed with Houston Area Driving Schools as your transfer school of choice. Signed Transfer Student Enrollment Contract (Signed by parent) after payment is made via our online system. During the school year we usually start a new teen driver education class on the first Monday of each month. The class days during the school year are Monday through Thursday with a slight variation during the holiday months. Our class times during the school year are 4:30-6:30 p.m. or 6:30-8:30p.m. During the summer, we usually have three different summer session and two different class times and held Monday through Friday. All teens must be 15 years old or 2 months away from 15th birthday to take our Teen Driver Education Classes. No exceptions. Houston Area Driving Schools Offers 32 Hours Online Classroom program with partner All-Star Driver Education T.D.L.R. (C#3131). All-Star Driver Education online course is 100% Texas state-approved and satisfies ALL of the required driver's education class for upcoming Texas drivers. Now you don't have to worry about rearranging your schedule, taking time off work, or missing any school because of All-Stars unique 32-Hour Classroom Instruction is provided from the convenience of your own computer! All-Star Driver Education course is set up as the "Block Method" so students will be required to complete the entire course before obtaining their certificate of completion DE-964 Form for student's learners permit. All-Star Driver Education will mail this certificate to the address listed on your online account, so please check all details when going through their registration process. Once the 32-hours course is complete, All-Star Driver Education will mail both certificates: One to Student and Parent and other transfer certificate to Houston Area Driving Schools to set up the driving times to complete teen's in-car driving requirements (7 Hours Driving and 7 Hours of Observation). State of Texas requires teens to complete 14 hours of in-car instruction along with the 32 hours of classroom instruction. Our in car program mirrors the in class sessions. 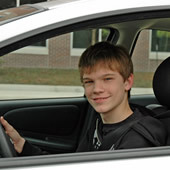 Driving is scheduled as soon as the student receives his/her permit from the Department of Public Safety. Students can schedule driving at the same time as class! Driving times are typically available before and after class or weekends. All drive times are 2 hours in length (one hour observation and one hour driving), this means behind the wheel training can get done in 7 sessions! Qualified Trained Instructors, Certified Licensed By T.D.L.R. Specific Lesson Objectives : our instructors do not "cruise" the road aimlessly. We fill each lesson with productivity, ensuring that each minute spent in the vehicle has purpose. Items that are covered: parallel parking, space management, intersections and lane changes skills and more! Vehicle Awareness : we teach that the driver is the pilot of the vehicle and it is the driver's responsibility to know their vehicle. A safe driver knows their vehicle and knows what to do to keep from damaging their vehicle (ie. the significance of the oil light or the alternator light). We all know that young drivers need a wide-range of experience driving on the roads. We understand that having a teen driver can be a discouraging and unnerving experience. Our Teen Tutoring was developed "to assist" the parent and teen to overcome the unnerving, frightening experience. Teen tutoring is available for students who have completed 32 hours face to face program, On-line program and parent taught programs. Let us assist busy parents with completing the state required 30 hours of behind-the wheel driving hours called 'Less Tears More Years Act', which requires new drivers to have more driving expereince prior to obtaining a license.